If you don't have much time on your hands and yet you feel like being a little indulgent, then this chocolate lava cake is the perfect choice, because it only takes two minutes to cook in the microwave. Yes, that's right, just two minutes to create this scrummy pudding. We've made mud / mug cakes on a number of different occasions, although sometimes they came out a little bit on the dry side. So that's when we decided to introduce something a bit gooey in the mixture, such as butter icing, chunks of chocolate or some Nutella hazelnut spread. Eggs are the most healthy ingredient within this recipe, and for every mug cake that you make, it will contain roughly one egg, so that's a nice bit of protein to make you feel a little bit better about all of the sugar! The following recipe is enough to make two mug cakes. This is an all-in-one method, so basically, mix together all of your recipe ingredients in a large bowl until you form a thick and smooth paste. In the bottom of two large mugs, place a teaspoonful of your Nutella spread (or similar) and then half of the cake mixture. 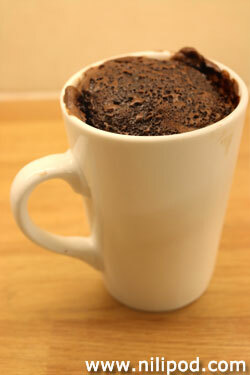 Next, in the middle of the cake, add two chunks of chocolate per mug before adding the remainder of the cake mixture. Then top this with another teaspoon of Nutella spread and cook both mugs together in the microwave for four minutes (or two minutes each). They will very quickly rise to the top of the mugs, and when you start eating them, the insides will be all lovely and gooey, although do be very careful as they will be piping hot.